I have written about how I became interested in law school, my first law school open house, tips on finding the school that’s right for you, my “right fit” story, and the three things that shaped my top choice law school. At this point, I bet you’re wondering where I’m at in the process. I submitted my applications a little over six months ago and have heard from all of the schools to which I applied. I have been accepted into the part-time evening program at a local law school and offered a conditional scholarship of $8,000. I was wait-listed at my top choice law school and am eagerly awaiting their decision. In the meantime, I will be pursuing the school that accepted me. Earlier this week, I attended a luncheon with other newly admitted students where a professor of Constitutional Law gave a presentation on the importance and process of analytical thinking. The presentation was engaging as the professor discussed the real world applications of “thinking like a lawyer,” complete with a hypothetical situation in which she challenged all of us to start thinking like lawyers. Thank you to the Mays Business School for making this image available for reuse. 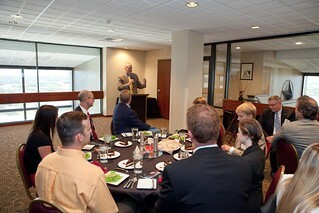 The luncheon was also a great opportunity to learn about and meet my future classmates. There were about a dozen attendees, many were from the area (San Francisco and the East Bay), and currently employed — several of which work as paralegals. While it was intimidating to hear that several attendees already had experience in the legal field, I hope that they will provide valuable insight over the course of our time together in law school, and I look forward to learning from them. Where are you at with your college/school admissions?